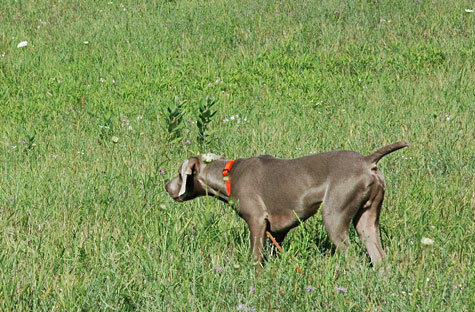 This morning we took both Elsa and Stuka to Pine Hill Kennel & Sportsman’s Club today for some bird work at their training field in Rockford, Michigan. 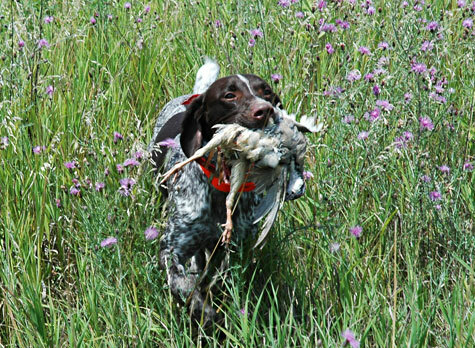 Working with our trainer Justin, we started by planting a number of grouse and worked on Stuka’s pointing. Out of 3 birds, Stuka missed the first one and it ended up being inadvertently flushed. The next two birds he pointed, flushed, chased, then returned to the original spot. The real excitement came on the last bird… Stuka pointed it twice. Here’s a rundown of the action. Stuka is watching the second bird flush after his first solid point. …chased by Stuka, lands in a tree, and is pointed again! We then worked on some “cold bird” retrieves with a Chukar, which was a nice compliment to the grouse introduction from the previous day. Stuka was very enthusiastic and performed well. The “watch” exercise he learned during last months basic obedience training came in handy as Stuka sat still and remained very focused.